• Breakfast, lunch and dinner in the Buffet Restaurant "El Tucán"
• For every 2 nights we will offer you a free a-la-carte dinner in el Rancho or the Miyako restaurants (subject to availability). A reservation is required. • Kid's club open from 09.00 - 17.00 Here children will have the opportunity to have fun while learning games with educational materials, under the supervision of highly qualified staff. They also have access to age-appropriate videogames and children's films. From Monday 1 July 2019 until Wednesday 31 July 2019: Enjoy 30 % off! From Sunday 14 April 2019 until Saturday 20 April 2019: Enjoy 45 % off! Surrounded by a wonderful natural environment, the Barceló Tambor is located in front of a beach paradise in the Pacific coast. 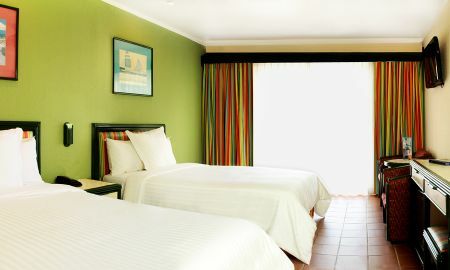 Barceló Tambor's cozy rooms boast a colonial style and offer views over the ocean or lush tropical gardens. The hotel has several restaurants where you can enjoy local and international specialities as well as various bars to have a cocktail or snack. Barceló Tambor offers guests the opportunity to do all kinds of water activities and outdoor sports during their stay, since it equipped with complete facilities. Moreover, the hotel is ideal for family holidays thanks to its entertainment program suitable for different ages and children's areas. The Barceló All Inclusive program (Todo Incluido), you will have access to all hotel facilities and enjoy particular services. The Barceló Tambor hotel is located in the magnificent Playa Tambor de la Bahía Ballena on the Nicoya Peninsula, 15 km from the town of Tambor. The flight from the Juan Santamaría Airport in San José to Tambor Airport takes about 25 minutes. You can also arrive by ferry from the port of Puntarenas (90 km from San José) to Puerto de Paquera (about 25 minutes' drive from the hotel by car).